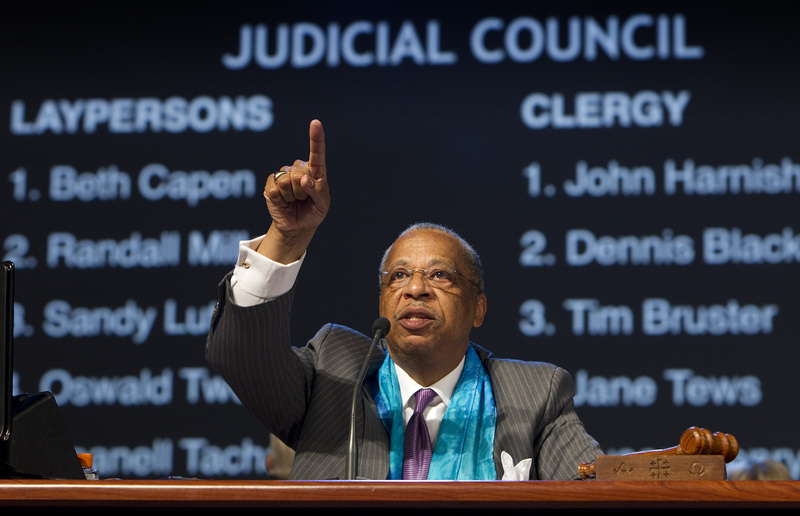 Bishop Robert E. Hayes Jr. takes nominations for the United Methodist Judicial Council during the denomination's General Conference in Tampa, Fla. A UMNS photo by Mike DuBose.Click on image to enlarge.View more photos. Two Africans were the top vote-getters for open seats on the United Methodist Judicial Council, the denomination's top court. The first woman ordained in the Southern Congo Conference, Kiboko recently was elected president of the denomination's African Clergywomen. She holds advanced degrees from Iliff and Perkins theological seminaries, currently serves as an associate pastor and has been a translator at General Conference since 1992. Blackwell has been pastor of Asbury United Methodist Church in Woodlynne, N.J., for 25 years and is enrolled in the Ph.D. program at Alvernia University. He also has a master's degree from Asbury Seminary and served on Judicial Council from 2004 to 2012. Elected to fill the council's two open lay positions were N. Oswald Tweh Sr., of the Liberian Conference in Africa, nominated by the Council of Bishops, and Beth Capen, New York Conference, who was re-nominated by the Council of Bishops after finishing her term on Judicial Council.